After seeing state nail and string art popping up on Pinterest last fall, I was sure it would be one of my Christmas DIY presents. Unfortunately, Princemas preparations took up my November and December crafting mojo. 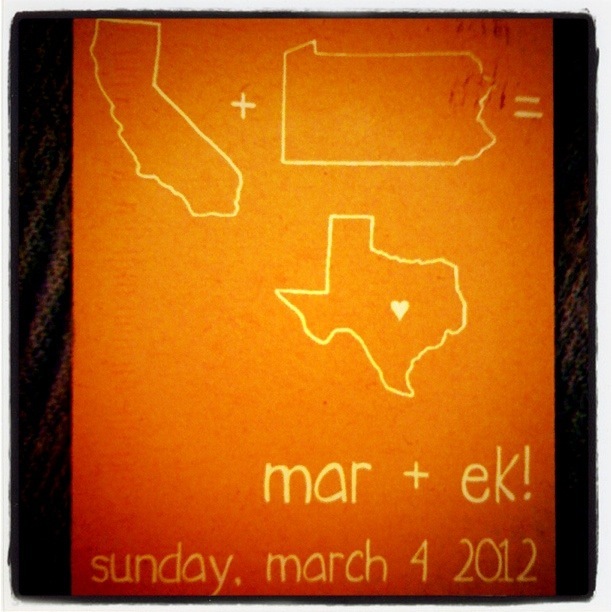 But when this wedding save-the-date came in the mail, I was inspired to make a Texas version for the bride and groom. First, sand your piece of wood to ensure all surfaces are smooth. 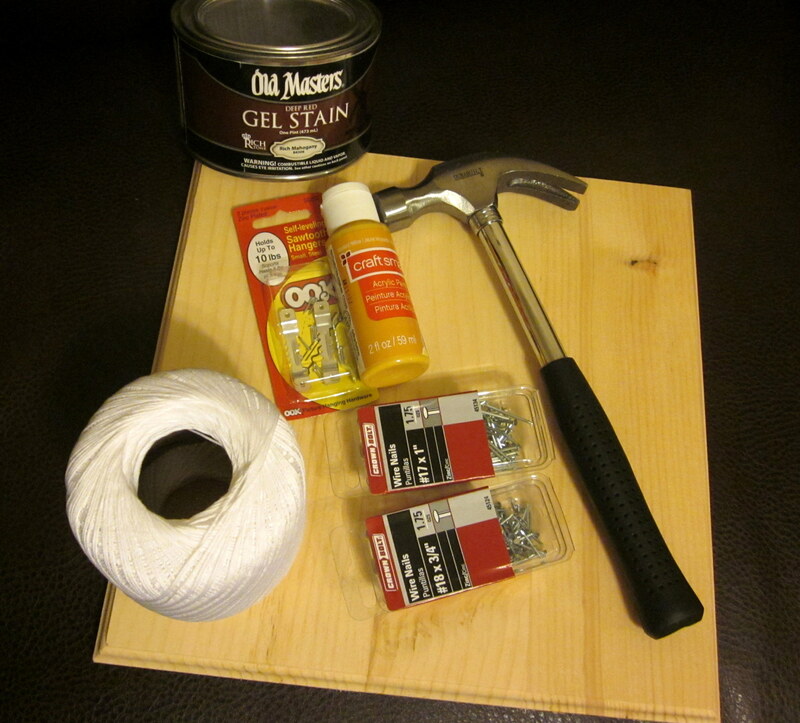 Paint the wood, use a primer if you’re painting with acrylics. (I had to paint seven coats because I didn’t prime the wood beforehand). Using painter’s tape, tape the state onto the piece of wood. Begin hammering nails around the state and heart with about 3/8 – 1/2 inch protruding. If nails are not perpendicular, use pliers to bend them into place. Using the crochet thread, tie a double knot around one nail. Begin threading each nail on the state outline to the heart and then back to the next nail on the outline. (I wrapped the thread around each heart nail about 8-10 times). If there are tough corners like the areas circled below, wrap the thread among the corner nails in the same direction (pointing towards the heart), but not actually to the heart nails. Continue threading back and forth between the state outline and heart until you end up back at the nail you started with. Tie a double knot and trim the excess. Optional: add a sawtooth hanger to the back. It took me about four hours to complete the hammering and threading steps; however, it was partly due to my poor choice of working on the floor instead of a table and using 5/8 inch nails for the first half which was a lot more challenging than when I switched to 3/4 inch nails. 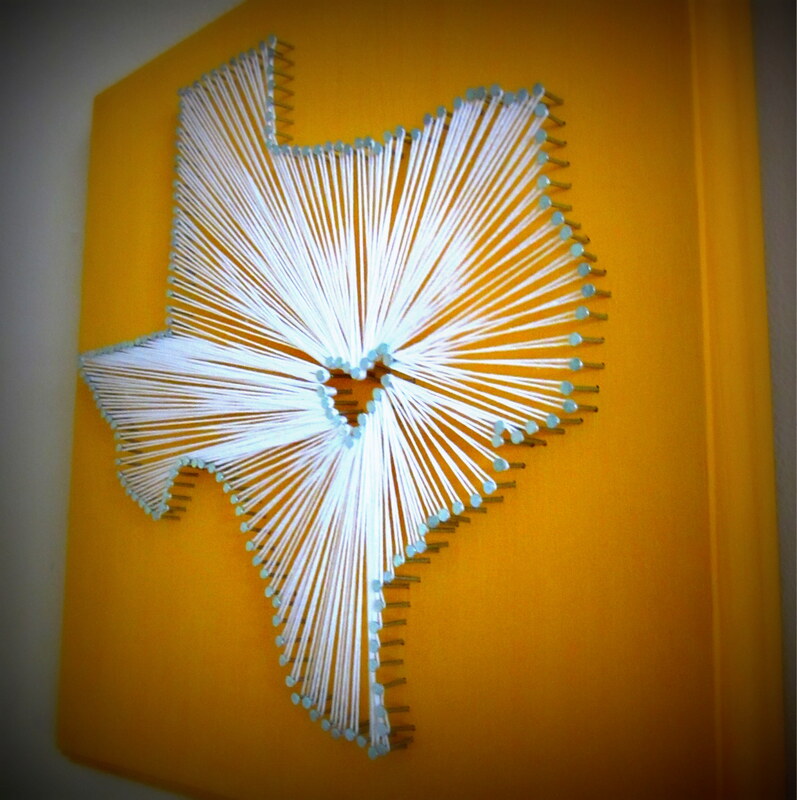 This entry was posted in Crafts, Gifts and tagged String Nail Art, Texas. Bookmark the permalink. I’m in love with this project. It’s going on my list of must do projects! Thats so awesome Linda!!! Can u make me a Vietnam one???? 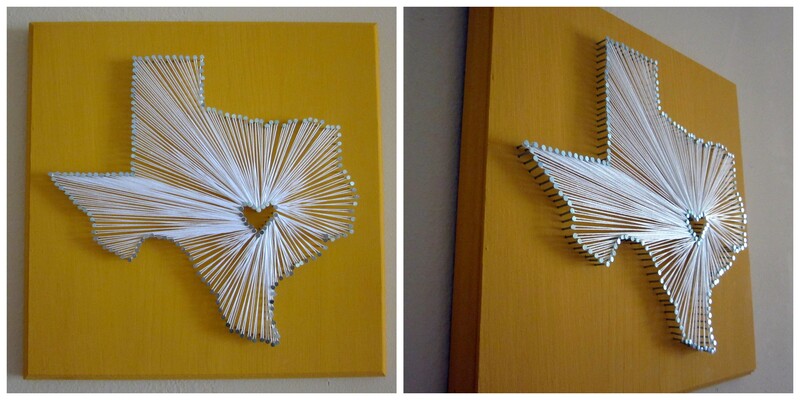 I’m going to make this one with the Texas Flag inside the shape of Texas. Great Idea! Thanks. That sounds like an awesome idea! Have fun! I’m making it right now! Only with San Antonio in the heart. Born and Raised! Woot! i’m stuck in Europe for now and can’t get the tools I need to do it like you did but I’m making it work. 🙂 Thanks for the post!!!!! Good luck with it and getting creative with the tools! I absolutely love these! Could you please make me one with Pennsylvania and the heart going over the capital city Pittsburgh? How much do you want for it?? Sorry I’ve been busy with my day job so don’t have time to make one for you. Thank you so much! No problem! Love Love Love this! Could be done with shapes other than states and the heart could be pretty much any shape too. Wonderful tutorial and gives me tons of inspiration. Thank you. Thanks Brie! In glad you found it helpful! My husband is in the army so we move around a lot! I would love to do this for each state we have been stationed in! We lived in two places in Virginia though…could this be done any way with two hearts? Thank you! That’s awesome that you would do it for each state. I’ve tried it with two hearts and it didn’t look as good. You just have to go around the two hearts a lot more so make sure they’re nailed in well. Thanks for the tutorial! How much string did it take? This is excellent. About how far apart did you place the nails from each other?